A couple weeks ago, while browsing some recipe blogs and cookbooks, I felt the urge to make something sweet. In the mood to try a new technique, and feeling rather festive, baking mini pies seemed perfectly appropriate. As some of you may know, 3.14 was Pi Day. 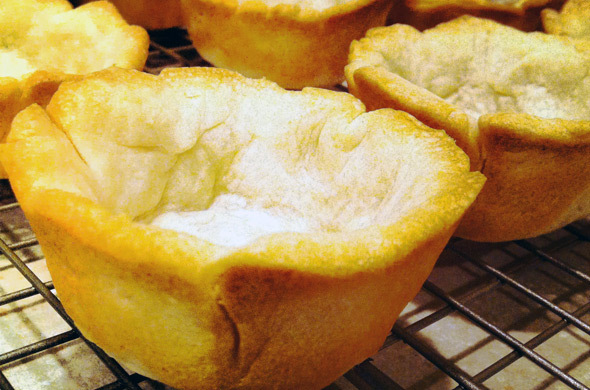 Set aside two 12-cup standard muffin tins ready. Prepare dough crust as directed. Lightly flour a clean work surface. Place dough on the floured work surface, and flour the top lightly. Roll dough into a large circle about 1/8 inch thick. It will be about 14 inches in diameter. Using a round biscuit or cookie cutter, cut out as many 4-5 inches in diameter circles as possible. Handling the dough circles gently, lift each circle and press it into a muffin cup, leaving a 1/8-to 1/4-inch (3-to 6-mm) overhang and patching any tears by pinching them together or plugging them with a dough scrap. Gather the dough scraps, form into a ball, and roll out again. Cut out more circles and repeat until all dough is used. (Try to not roll dough more than twice as it will bake tougher the more you handle it.) You should have 12-16 circles total. In a large, heatproof bowl or using the top pan of a double boiler, combine the chocolate, cocoa powder, butter, coffee and rum. Set over barely simmering water and stir constantly until melted and smooth. Remove from the heat and let cool for 15 minutes. In a stand mixer fitted with the whip attachment, or using a handheld mixer and bowl, combine 1 ½ cups (360ml) of the cream and the vanilla and whip on medium-high speed until soft peaks form. 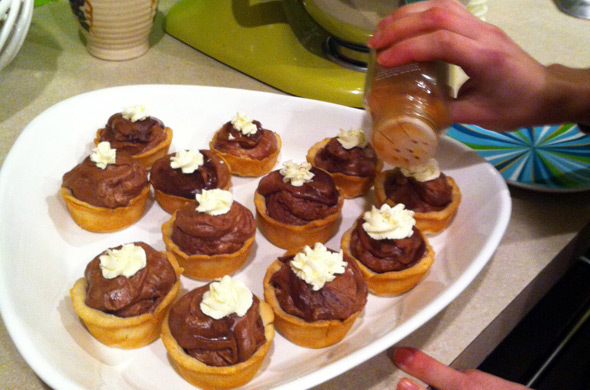 Fold 1/3 of the whipped cream into the chocolate mixture to lighten it. Then, fold in the remaining whipped cream just until combined. (Note: It’s better to have some streaks of cream in your mousse then to stir the mixture until it loses its airiness.) Cover the mousse and refrigerate for at least two hours or up to three days. Whip the remaining ½ cup (120 ml) cream until soft peaks form. Refrigerate until ready to assemble pies. In a small bowl or custard cup, combine cocoa powder and cinnamon. Or, keep both handy for sprinkling one after the other. Once you are going to serve your pies, or up to 24 hours ahead, spoon about ½ cup mousse into each crust. 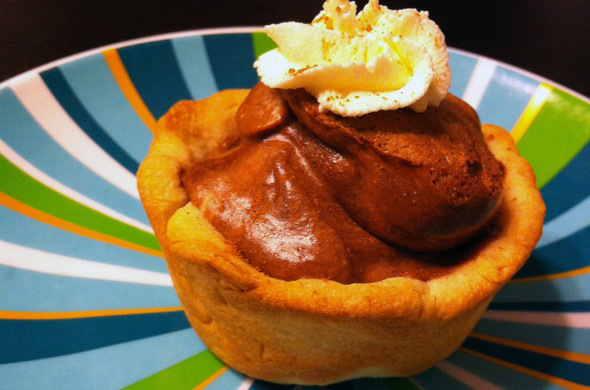 Top the mousse with a dollop of the whipped cream and dust with cocoa powder and cinnamon mixture. Serve immediately, or cover and refrigerate for up to three days. These pies can also be frozen for up to one month without the cream topping. Bring to room temperature and add the cream topping just before serving. The chocolate mousse was rich and not too sweet. The intense chocolate, folded with the fresh whipped cream created a fluffy and heavenly contrast to the deep chocolate flavor. The flavor notes certainly depend on the type of chocolate you use, as well as the coffee and rum. I used Droste cocoa powder with Ghirardelli chocolate and it was a winning combination. The coffee was from Elm Street Bakery and the rum was 10 Cane Rum, which is my favorite. These little pies are perfect for a dinner party or to surprise a loved one with when you say you’re bringing dessert. And they truly aren’t much more work than making one large pie. They take about the same amount of time as cupcakes, and you can even decorate them similarly. Get creative and play around with the fillings and toppings. I plan to make these again with a variety of my favorite pie fillings, such as banana cream or chocolate peanut butter. I may even reinterpret them as strawberry shortcake cups. With good pastry at the base and yummy fillings, anything is possible!